Carrizo Springs may have outhit the Varsity Warhorses but they could not out score the Warhorses in the 8-3 Devine victory on April 5th. Devine took the lead in the first inning and continued to score in the second, fourth, and fifth innings. Top of the first, 2 outs, Dalton Kramer singled and reached first. Newt Crouch hit a double to center and Kramer scored. Top of the second, 2 outs, with Gehrig Runyan on third, Isaiah Oropeza on second, and Joseph Guajardo on first, Dalton Kramer hit a ground ball and reached second on an error while Runyan and Oropeza scored. Top of the fourth, Runyan hit a single followed by a walk from Blaine Miller. Oropeza hit a ground ball and Runyan scored. Joseph Guajardo ground out but Miller made it home for anther Warhorse run. Dalton Kramer ground out for the second out and Oropeza scored. Devine 6, Carrizo 0. Top of the fifth, 2 outs, Truett Barron on third and Ralph Rios on first, Blaine Miller singled to center and Barron and Rios scored. 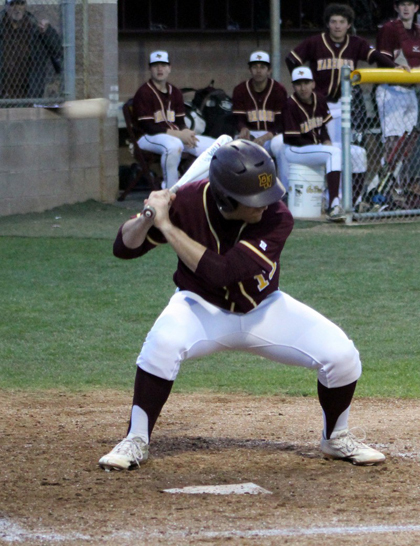 Devine won 8-3 after seven innings. Oropeza 2 runs, 1 hit. Guajardo 1 RBI. Kramer 1 run, 2 hit, 1 RBI. Crouch 1 hit, 1 RBI. Barron 1 run, 1 hit. Rios 1 run, Runyan 2 runs, 2 hit. Miller 1 run, 1 hit, 2 RBI. Brady Harrell threw 55 strikes in 87 pitches and Kramer threw 9 strikes in 15 pitches. The Warhorses are 4-1 in district and 14-6 overall. They will face Crystal City this Friday, Pearsall on April 16th, S.A. Wagner on April 19th, and then in Hondo on April 23rd.